I use plastic bottles to make large pots lighter before I add potting soil. It makes pots easier to carry, cuts down on the amount of soil needed, and is better for shallow-rooted succulents. Before I plant any tall or large pot, I half-fill it with tightly capped empty water bottles. Good design and aesthetics dictate that large spaces need large pots. They make a “wow” statement in any garden, patio, entryway or sunroom. Pots that aren’t in scale with a big space can be visually lost or add clutter. This is Amy VanLiew’s garden. See more examples of large pots in garden spaces. Problem is, if you fill a big pot with soil, you might not be able to move it, especially after you water it. And if succulents sit atop soil that never dries, roots may rot. My solution, a result of trial-and-error, also works for window boxes. To make my deep window boxes less heavy, there’s a layer of plastic bottles beneath the soil. — Initially I tried placing a succulent, still in its nursery pot, inside a tall glazed pot. The plastic rim showed, which looked tacky. I tried the nursery plant in a different large pot. The plastic pot dropped too far inside, making the succulent look like it was hiding. Not to mention I hoped to put more than one succulent in the focal-point pot. I considered half-filling it with rocks, but being denser, they’re even heavier than soil. As for lightweight organic matter, like chipped wood, it makes the soil level sink as it decomposes. — I tried keeping the lower half of a large pot empty by using a pot saucer as a shelf inside it. It was tricky to find a saucer that fit and would rest where I wanted it to (about a foot below the rim). Plus it needed a drainage hole. — Next I tried filling the bottom half of a large pot with styrofoam packing peanuts. Later, when I emptied the pot to reuse it, I discovered that wet soil plus styrofoam equals a sodden mess that’s no fun to dispose of. — I also tried dumping clean items from my recycling bin into a hefty pot, but discovered that bottles and crushed cans hold soil and water—an anaerobic mix that becomes a microbial soup. Even bubble wrap, when stuffed into a pot, forms nondraining pockets. I fill large pots half full with empty plastic water bottles, tightly capped. As far as roots are concerned, bottles are the same as rocks. Yet empty plastic water bottles don’t weigh anything. Some soil does fall into gaps, so it’s a good idea to pour pumice into the pot prior to adding potting soil. Pumice, a lightweight volcanic rock, absorbs excess moisture. Make sure bottles are tightly capped, so inside them is only air and the weight of the soil won’t make them collapse. Empty water bottles make big pots weigh less, save on soil, prevent soggy roots, and are easy to remove when emptying the pot. Simply hose them off before returning them to your recycling bin. 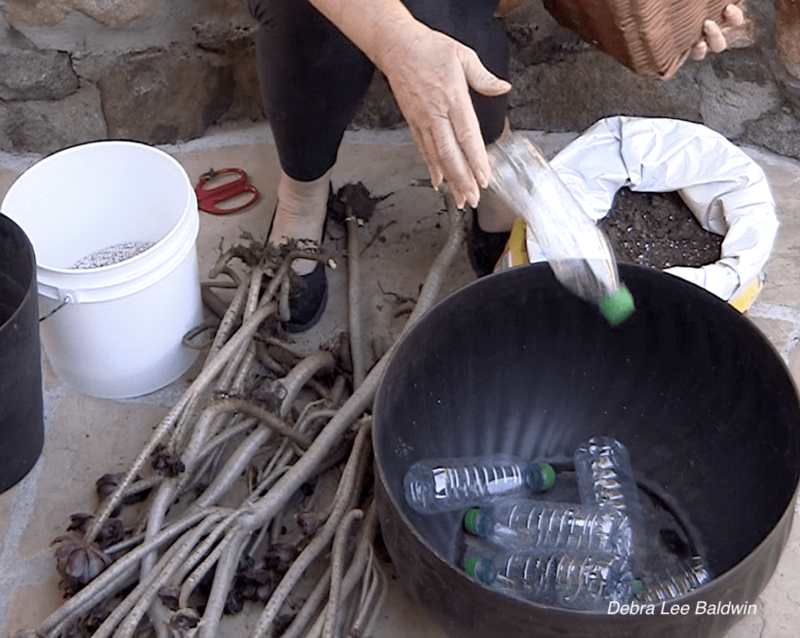 — Assemble your materials: Pot, plants or cuttings, empty plastic water bottles, potting soil, pumice. — Place empty bottles in the pot to midlevel, or to about 12 inches from the rim. — Add enough pumice to nearly cover the bottles. — Remove plant/s from nursery pot/s and arrange in pot. — Add soil so the crown of the plant (where roots meet stem) is a bit lower than the rim. OR, if planting cuttings, simply insert them in the soil. — Move pot to its new location. Protect flooring from drips if need be. Water lightly to settle roots. — After a week or so, insert a wood chopstick several inches into the soil to check its dryness. If the stick comes out clean, add water until it flows out the drain hole.